The first step in a coronal weather report is to make a map of the photospheric magnetic field. Solar scientists can make a map of the Sun much like Earth scientists map the Earth. 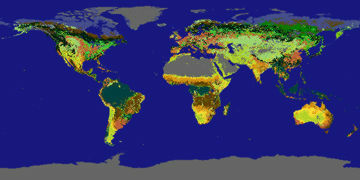 Each of these images show a globe view which has then been laid out into a flat map format. By watching features rotate across the disk of the Sun we can piece together a map of the full solar surface. The second map is a map of the Sun's corona in extreme ultraviolet light. The dark feature at the top of the disk is known as a coronal hole, where open field lines extend out into space. The last map, in black and white, is a map of the photospheric magnetic field. Here, white indicates the magnetic field points out of the Sun, and black indicates it points into the Sun. Gray indicates very little field at all, though notice the small black and white speckles of the quiet Sun field. The black and white spots with stronger fields, which show up in pairs or more complicated groups, are called active regions. 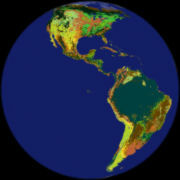 This type of map is used as the starting point for the computer modeling code which generates a coronal weather report. Step two in a coronal weather report is to calculate the coronal magnetic fields based on the boundary conditions provided by the photospheric magnetic map. In the image below red and green represent different magnetic polarities, corresponding to the white and black in the map above. The photospheric magnetic field can be seen on the colored surface of the Sun, while the black lines represent the computer generated model of the coronal magnetic field. As you can see, the model even reproduces open field lines at the poles, which are responsible for the coronal holes seen in observations. Ready to see how this works in practice? Click on the appropriate button for your internet connection and then click "Start the Activity" for the Coronal Weather Forecasters Modeling Activity!